Shop Talk – Interesting USB Powered 3D print Clean Up Tool! In this episode, we will be at this interesting USB powered 3D print cleanup tool! As I have been looking at several options, but the cost I felt was too high. However $35.00 this seem while still a little high, but affordable so I put down the cash and ordered one and was a bit impressed! Check it out! 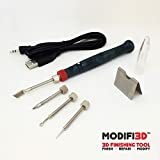 HEATED 3D PRINT FINISHING TOOL with 4 specially coated interchangeable tips designed to FINISH, REPAIR and MODIFY 3D printed parts. ← Wanhao Duplicator I3 3D Printer – Modification Updates and Printing TPU!